In southern Afghanistan, reinforcements don’t just come from the U.S. The small eastern European nation of Georgia is preparing for its third rotation of infantry battalions in Helmand province, where it has fought alongside Marines in some of the toughest terrain in Regional Command-Southwest. On Friday, Georgia’s 33rd Light Infantry Battalion held a ceremony to mark the beginning of its deployment to Afghanistan, according to photographs released by the Corps. It was attended by 3rd Battalion, 7th Marines, out of Twentynine Palms, Calif., which trained the unit for war earlier this year as part of the Georgia Deployment Program, which prepares Georgian troops to deploy alongside Marine units in combat. 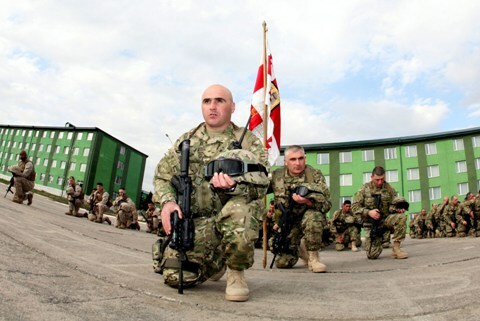 As noted in this Marine Corps Times story recently, Marine commanders have credited Georgian troops with fighting fiercely in combat, something not all allies in the International Security Assistance Force will do. In turn, the Georgians work closely with the U.S. — a significant benefit, considering tensions remain high with Russia, which invaded and bombed Georgia in 2008. The training program will likely be extended, Marine officials said during a command brief I attended in Georgia last month. A drive through the countryside there shows plenty of buildings still heavily damaged from the fight with Russia. As a Georgian American I salute my Georgian and American brothers in their fears attempt to bring peace to Afghanistan and end Taliban’s long grip on freedom of Afghan people and the region as a whole. Hooray!!! Georgia should not add an additional batalion to the Afganistan (NATO) mission.